This chapter provides a case study that gives a practical example of how ITU standards for broadband are improving access to the Internet, in particular, using digital subscriber line (DSL) and cable modem technologies. Although most people have heard of broadband, few know exactly how they could begin to define it. Many would probably associate broadband with a particular speed or set of services, but in reality the term “broadband” is like a moving target. Internet speeds are increasing all the time, and at each new advance, marketeers eagerly emphasize just how blazingly fast the latest connection speeds are. It is revealing to look back at advertisements for 14.4 and 28.8 kbit/s modems, for example, just to see how every step is considered “blazing” at the time. It is also important to acknowledge that broadband technologies are always changing, and that a report like this necessarily reflects just a “slice in time”. One can therefore only really talk about the “current” state of broadband, and make tentative extrapolations, based on planned or incipient developments, that may or may not come to fruition in the future. The term broadband is commonly used to describe recent Internet connections that are significantly faster than earlier dial-up technologies, but it does not refer to a certain speed or specific service. For instance, what was termed as a “fast” Internet connection two years ago is now designated as “narrowband”. While the term broadband is used to describe many different Internet connection speeds, Recommendation I.113 of the ITU Standardization Sector (ITU-T) defines broadband as a transmission capacity that is faster than primary rate ISDN, at 1.5 or 2.0 Mbit/s. However, this definition is not strictly followed. The OECD considers broadband to correspond to transmission speeds equal to or greater than 256 kbit/s. In this chapter, we define broadband as the last-mile connection to the end-user, although some of these last-mile technologies may also be used for back-end infrastructure. Indeed, wireless technologies such as Wi-Fi have been used to form backbone Internet connections in countries such as Bhutan that do not have a developed wireline infrastructure. It is also important to bear in mind that broadband speeds are only as fast as the slowest portion of the network connecting them to the Internet. Therefore, the speeds referred to here are considered to be maximum speeds that will in fact vary according to type of available infrastructure and level of network congestion. For all that broadband may enable in terms of applications and services, the availability of broadband depends primarily on infrastructure. Around the world there does not appear to be a universally optimal broadband technology. Rather, different broadband technologies seem suited to different environments, with relative benefits depending largely on what they are used for. This is corroborated by the fact that a technology that proves successful in some countries may not work well in others, due to economic, cultural, political, geographical, or other factors. Indeed, the medium of choice may depend upon the legacy medium (where existent), the regulatory framework, and the supporting institutional arrangements. Although most of the marketing literature differentiates broadband according to transmission speed (bandwidth), there are in fact a number of different characteristics that help determine the appropriateness of a particular broadband platform for a particular application. These include latency (very important in on-line gaming); burstiness (important for file-sharing applications); mobility and the ability to interwork with other platforms. While there is no one-size-fits-all broadband technology, broadband can be said to fall into two basic categories: wired (fixed-line) and wireless. This chapter discusses two of the most popular fixed-line broadband technologies, highlighting some of their benefits and drawbacks. Broadband has tended to follow the evolutionary pattern pioneered by traditional phone service; in other words, connections are initially established over fixed lines and eventually become available over wireless networks as technology develops. Where broadband is concerned, wired connections account for the vast majority (over 98 per cent) of current connections—although wireless technologies are starting to grow quickly. For fixed-line connections, digital subscriber line (DSL) technologies are the most popular worldwide, followed closely by cable. By region, DSL is more common than cable in Asia and Europe but the opposite is true in the Americas. While DSL and cable modem technologies have largely been built on top of existing networks, some new transmission technologies, such as fibre optic cables, have been gaining in popularity as well (see Figure 7.1). These are explained in greater depth in the sections that follow. DSL leads with cable technologies not far behind. Other technologies have yet to make a large footprint. Building upon the traditional analogue system that formed the basic telephone network, the integrated services digital network (ISDN) was the digital switched network technology that first enabled improved quality and speed, not only for the transmission of voice, but also of data and images. While ISDN offered a significant upgrade to traditional copper phone lines, digital subscriber lines (DSL) have advanced the technology and increased the speeds further still. A key advantage of DSL technologies is that they use existing copper twisted pair wiring and do not require new cabling as would say, fibre optics. DSL utilizes different frequencies to split voice and data services over the same standard phone line. Previously, phone networks only used a small portion of the available bandwidth for voice traffic. However, DSL has taken advantage of the unused space on the copper pair to include data traffic (see Figure 7.2). DSL speeds are influenced by the distance between the subscriber and the local exchange, the gauge of the phone wire, and the type of DSL technology. A main benefit of DSL technologies is that they offer a dedicated amount of bandwidth that does not vary with the number of subscribers in an area. This is because each line functions like a complete circuit to the central office of the operator. Cable and wireless technologies can suffer from congestion when more and more users start using the allotted bandwidth for an area. This makes DSL technologies ideal for home and business use that need a certain amount of bandwidth available at any given time. In its various forms, DSL is the most popular broadband technology in the world. In 2002, 64 per cent of broadband countries had more DSL lines than cable connections. The Republic of Korea led the world in DSL penetration in 2002 with 13.4 subscribers per 100 inhabitants followed by Iceland (8.4), Hong Kong, China (8.3), Taiwan, China (8.1), and Japan (5.5). Importantly, the rate of DSL deployment often hinges on whether the incumbent operator is willing or not to open the local loop to competitors. This process is known as local loop unbundling (LLU). Source: ITU, ITU World Telecommunication Indicators Database. DSL comes in several different “flavours” that offer different benefits. Some are more suited for residential use and others for business. 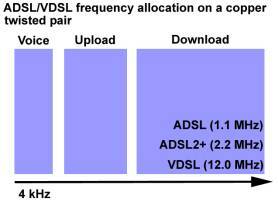 Asymmetric DSL (ADSL), for instance, is a form of DSL where more bandwidth is allocated to download than to upload. This makes it ideal for web browsing and typical Internet usage, where downloading of large files is more important than uploading, because it enables maximum speeds of 8-10 Mbit/s downstream and a maximum of 1 Mbit/s upstream. ADSL is available at a maximum distance of 3 km from the local exchange. It is well suited to residential use because it shares a single twisted copper pair with voice, allowing users to use the telephone and surf the Internet simultaneously on the same line. ADSL is the most popular form of DSL offered around the world and the transceivers falling in this category are described in the ITU-T Recommendations of the G.99x-series. Originally, ADSL installations required a physical splitter to separate out voice and data traffic. These installations had to be performed by technicians and significantly increased the cost of installing an ADSL line. However, G.lite allows for a splitter-free connection that simply requires the modem to be plugged in, thus drastically reducing the expense and difficulty of rolling out ADSL service. In addition, this ITU Recommendation extends the reach of ADSL by sacrificing speed; G.lite can reach 5.4 km but its maximum download speed is limited to 1.5 Mbit/s whole upload speeds are limited to 512 kbit/s. G.lite has been used to connect areas that were previously inaccessible via standard ADSL. It has also facilitated so-called “plug and play” installations, by users themselves. Single pair high-speed DSL (SHDSL) is defined in a recent ITU Recommendation (ITU-T G.991.2) for symmetric, high-speed DSL. SHDSL connections are best suited for servers (web, FTP, file) and other business uses such as video conferencing that require high speeds in both directions. SHDSL uses a copper pair to send and receive data through two bands, which allow for speeds up to 2.3 Mbit/s in both directions. By including a second copper pair, SHDSL speeds can reach 4.6 Mbit/s in each direction. These speeds are possible over a 3 km range with data rates attenuating for longer distances. The two SHDSL bands send data over the low frequencies to extend the reach of the loop, making it impossible for SHDSL to carry a voice channel (POTS or ISDN) like ADSL. This lack of voice capability imposes significant installation costs in the local loop—a cost that is passed on to the consumer through higher subscription costs. Therefore, SHDSL is more suitable as a replacement for traditional leased lines for business (businesses can usually absorb higher subscription rates than private users) rather than for the consumer market. In some parts of Europe, SHDSL is referred to simply as SDSL, not to be confused with a different standard of the same name used in North America, which is described below. SDSL is a proprietary standard mainly used in North America, but which even there is losing popularity to SHDSL. SDSL offers equivalent traffic flow in each direction but, like SHDSL, it cannot share the line with analogue signals, thus posing significant installation/modification costs in the local loop. SDSL is best suited to sites that require significant upload speeds such as web/FTP servers and business applications. The capacity of SDSL is adjusted according to signal quality and speeds and distance combinations ranging from 160 kbit/s over 7 km to 1.5 Mbit/s over 3 km are offered. Higher speeds are possible by combining multiple twisted pair wires. ITU-T G992.3 (ADSL2) and ITU-T G.992.4 (ADSL2plus) are the sequels to the original ITU-T ADSL Recommendation, which is to date the most successful broadband technology in the world, and enables improved speed, reach, power consumption and other technical elements over the original version. When developing the two new Recommendations, ITU-T was able to incorporate feedback from service providers and end-users. ADSL2 can deliver 8‑12 Mbit/s while extending the reach of the original ADSL by 300 metres. The main improvements over the original ADSL standard can be summarized as follows. The speed and reach increases in ADSL2 are largely owed to improved performance on long lines in the presence of interference. Other improvements include addressing several technical issues that appeared with original ADSL standards. The new Recommendations allow for the use of filters, rather than splitters, at both ends of the connection. This offers cost savings, obviating the need for a technician to install splitters at the home or office. ADSL2 also introduces power management features into ADSL modems, allowing for more cost-effective operation on both sides of the connection. Original ADSL equipment remains in an always-on state, using the same amount of energy regardless of whether data is being transferred or not. ADSL2 introduces three power states for the equipment, each corresponding to need. The highest power levels are used during large downloads as they allow for more bandwidth. Lower power levels are used during periods of inactivity, allowing for energy savings both at the central office and at the customer premises, all while maintaining an always-on connection. The new ADSL2 Recommendation also realigns the voice channels and offers providers the ability to combine multiple ADSL2 lines for faster bandwidth to certain customers. In addition, ADSL2 systems can enter an “all-digital” mode where voice channels are reassigned to data, similar to SHDSL. This is especially important for business lines that may not need voice services over the ADSL2 line. ITU-T Recommendation G.992.5 (ADSL2plus or ADSL2+) builds further on ADSL2, increasing the bandwidth by extending the usable frequencies on the line. While both technologies use the same frequencies for telephone calls, and uploading data, the download channel is extended from a maximum of 1.1 MHz with ADSL2 to 2.2 MHz with ADSL2plus. This increases download bandwidth from 8 Mbit/s with ADSL2 to 16 Mbit/s with ADSL2plus. These speeds are possible over 1.5 km and higher speeds may even be possible. VDSL (ITU-T G.993.1) is the latest form of DSL and offers the fastest DSL speeds over short distances to date, at 52 Mbit/s of bandwidth over a standard twisted pair cable. While the speed is much higher than other DSL technologies, it comes at a price: decreased reach of the network. This makes VDSL the optimal choice for branching out short distances from fibre connections, rather than, for example, providing longer-range broadband to rural communities. VDSL was originally named VADSL but the “A” (for asymmetric) was dropped because VDSL can support both symmetric and asymmetric transport. These connections can be very fast because the physical distances are kept very short, allowing for maximum throughput. As fibre optic networks continue to move closer to communities around the globe, VDSL will become increasingly important as a way to bridge the last-kilometre gap. The Republic of Korea has made extensive use of VDSL technologies in apartment buildings around the country as a way to share fibre connections arriving in the basement of apartments. Fibre connections are difficult to install in places that require twists and turns, such as apartment buildings. By using VDSL, which involves a twisted copper pair rather than fibre, the short distances to each apartment can be covered. While DSL is the most prevalent broadband technology in the world, cable modem technology is not far behind (see Figure 7.1). Cable broadband access may not be as prevalent in the world as DSL, but it dominates in some markets with a fully developed cable television network. In 2002, the Republic of Korea led the world in cable broadband connections with 7.7 subscribers per 100 inhabitants, while Canada (5.2), the Netherlands (4.9), Switzerland (3.6) and Belgium (3.5) round out the top five economies. Cable networks were originally designed for one-way video transmission. Cable companies provided video that was sent, or broadcast, over lines to subscribers’ homes. However, as the networks have evolved, new equipment has made it possible to send data in both directions on a cable network, (i.e. downloading and uploading from a household), thus making Internet access over cable a viable solution. The physical cable network sends different “channels” on separate blocks of 6 MHz frequencies along the same cable. Originally, these channels each carried different television channels until a method was developed to reserve unused channels and dedicate them to Internet traffic. One channel sends data from the Internet to users (6 MHz of frequency corresponds to roughly 30 Mbit/s) and another channel is used to send data back on the Internet from households (see Figure 7.3). These reserved channels are “broadcast” around the network to all subscribers in a certain area. Each cable modem can recognize which parts of the broadcast are destined for it and pull them off the network. Cable modems are then able to send information back to the Internet by waiting for their “turn to talk” on the response channel and essentially broadcasting their request in quick bursts back to the central office of the cable company. All cable subscribers in a small area share the same channels to send and receive data, and the amount of bandwidth users receive is directly tied to how much bandwidth their neighbours are using. If no other users are using a cable node at a given time, cable subscribers may theoretically have disposal of all of the combined bandwidth allotted to their own and their neighbours’ homes. Conversely though, during heavy usage, cable modem subscribers can see significant reductions in their bandwidth. Typically, 1.5 Mbit/s download speeds or higher can be expected over cable modems during normal usage times. In order to protect against abuse, many cable companies have restricted the upload bandwidth to 128 kbit/s in order to stop high-bandwidth users who use more than their share from running server or peer-to-peer applications on their home computers. Cable companies have also found another way to increase the bandwidth of users in an area by simply dedicating additional channels to data and dividing the number of users on a particular node. Source: ITU-T Recommendation J.122, ITU-T Study Group 9. Cable modem technologies are being standardized in ITU-T Study Group 9 based on technologies originally developed by Cablelabs called DOCSIS (Data over Cable Service Interface Specification). The first generation of cable modems were built on ITU-T Recommendation J.112, however a new ITU-T Recommendation J.122 was approved at the end of 2002 and offers improvements to the existing standard while maintaining backwards compatibility. The new standard improves the way the cable modem broadcasts data back to the central office, allowing for more economical use of existing bandwidth. SG9 is another project, named IPCablecom, which focuses on the delivery of real time services over cable television networks as discussed below. In their conversion to digital television, cable television systems in many countries are provisioning very high-speed bi-directional data facilities to support, among other payloads, those utilizing the Internet Protocol (IP). These operators want to expand the capability of this delivery platform to include bi-directional voice communication and other time-critical services. IPCablecom is a project organized in ITU-T Study Group 9 (SG9) for the purpose of making progress towards the development of a coordinated set of ITU-T Recommendations that will specify an architecture and a set of integrated protocol interfaces that operate as a system to enable the delivery of time-critical interactive services over cable television networks using the Internet Protocol (IP). The new set of Recommendations will address a series of SG9 Questions currently under study including Questions 6/9 (Conditional access methods and practices for digital cable distribution to the home), 10/9 (Functional characteristics for the interconnection of cable networks with the public switched network and other delivery systems), 12/9 (Cable Television delivery of advanced multimedia digital services and applications that use Internet Protocols (IP) and/or packet-based data) and 13/9 (Voice and Video IP Applications over cable television networks). The initial focus of work within IPCablecom has been targeted at providing an integrated system for cable that can support a wide variety of time-critical interactive services within a single zone. In the IPCablecom architecture, a zone is defined as the set of devices (client, gateway, and other) that are under the control of a single supervisory function, which is referred to as a Call Management Server (CMS). Future work will consider the study of issues associated with communication between zones as well as issues associated with the support of intelligent client devices. In order to meet the market requirements of cable operators, the IPCablecom specifications are being developed on an aggressive time schedule. The established and currently planned Recommendations for development are listed below. According to the ITU-T Recommendation J.160, the IPCablecom architecture at a very high level has to connect with three networks: HFC access network, managed IP network and PSTN. The system architecture should describe the specifications of the functional components and define the interfaces between these networks and IP-based cable television networks. The reference architecture for IPCablecom is shown in Figure 7.4. The Cable Modem HFC access network provides high-speed, reliable, and secure transport between the customer premise and the cable headend. This access network may provide all Cable Modem capabilities including Quality of Service. The Cable Modem HFC access network includes the following functional components: the Cable Modem (CM), Multimedia Terminal Adapter (MTA), and the Cable Modem Termination System (CMTS). The Managed IP network serves several functions. First, it provides interconnection between the basic IPCablecom functional components responsible for signalling, media, provisioning, and quality of service establishment. In addition, the managed IP network provides long-haul IP connectivity between other Managed IP and Cable Modem HFC networks. The Managed IP network includes the following functional components: Call Management Server (CMS), Announcement Server (ANS), several Operational Support System (OSS) back-office servers, Signalling Gateway (SG), Media Gateway (MG), and Media Gateway Controller (MGC). Both the Signalling Gateway (SG) and the Media Gateway (MG) provide connectivity between the managed IP network and PSTN. An IPCablecom zone consists of the set of MTAs in one or more Cable Modem HFC access networks that are managed by a single functional CMS as shown in Figure 7.5. Interfaces between functional components within a single zone are defined in the IPCablecom specifications. Interfaces between zones (e.g., CMS-CMS) have not been defined and will be addressed in future phases of the IPCablecom architecture. An IPCablecom domain is made up of one or more IPCablecom zones that are operated and managed by a single administrative entity. An IPCablecom domain may also be referred to as an administrative domain. Interfaces between domains have not been defined in IPCablecom and are for further study. Table 7.1 below lists the set of IPCablecom Recommendations established or that are currently planned for development along with the current status of each document. Defines architecture framework for IPCablecom networks including all major system components and network interfaces necessary for delivery of IPCablecom services. Defines the audio and video codecs necessary to provide the highest quality and the most resource-efficient service delivery to the customer. Also specifies the performance required in client devices to support future IPCableCom codecs. and describes suggested methodology for optimal network support for codecs. Defines a profile of the Media Gateway Control Protocol (MGCP) for IPCablecom embedded clients, referred to as the Network-based Call Signalling (NCS) protocol. MGCP is a call signalling protocol for use in a centralized call control architecture, and assumes relatively simple client devices. Defines the QoS Architecture for the “Access” portion of the PacketCable network, provided to requesting applications on a per-flow basis. The access portion of the network is defined to be between the Multimedia Terminal Adapter (MTA) and the Cable Modem Termination System (CMTS). The method of QoS allocation over the backbone is unspecified in this document. Defines the concept of Event Messages used to collect usage for the purposes of billing within the IPCablecom architecture. Defines the Internet Signalling Transport Protocol (ISTP) for IPCablecom PSTN Signalling Gateways. ISTP is a protocol that provides a signalling interconnection service between the IPCablecom network control elements (Call Management Server and Media Gateway Controller) and the PSTN C7 Signalling network through the C7 Signalling Gateway. Describes the framework in which IPCablecom MIBs (Management Information Base) are defined. It provides information on the management requirements of IPCablecom specified devices and functions, and how these requirements are supported in the MIB. It is intended to support and complement the actual MIB documents, which are issued separately. Defines the MIB module which supplies the basic management objects for the MTA Device. Defines the MIB module which supplies the basic management object for the NCS protocol. Defines the Security architecture, protocols, algorithms, associated functional requirements and any technological requirements that can provide for the security of the system for the IPCablecom network. Defines a Trunking Gateway Control Protocol (TGCP) for use in a centralized call control architecture that assumes relatively simple endpoint devices. TGCP is designed to meet the protocol requirements for the Media Gateway Controller to Media Gateway interface defined in the IPCablecom architecture. Defines the management Event Mechanism that IPCablecom elements can use to report asynchronous events that indicate malfunction situations and notifcation about improtnt non-fault situation. Specifies minimum device requirements for embedded multimedia terminal adapters in the areas of physical interfaces, power requirements, processing capabilities and protocol support. Defines an architectural model for end-to-end Quality of Service for IPCablecom Inter-and Intra-Domain environments. Defines the architecture and protocols that are required for playing announcements in Voice-over-IP (VoIP) IPCablecom networks. Defines the MIB (Management Information Base) for Management Event Mechanism that IPCablecom elements can use to report to management systems and/or local logs asynchronous events. Defines the interface used between Call Management Server (CMS) and Provisioning Server for the exchange of service provisioning information. Describes the CMS to CMS Signalling protocol intended for use by a CMS to communicate with another CMS in order to support packet-based voice and other real-time multimedia applications. Defines Telecommunications for disaster relief over IPCablecom networks and its interworking across different networks. The growing popularity of the Internet and other IP-based networks has increased requirements for telecommunications capacity and bandwidth which has driven much innovation in telecommunication access and transport networks. Some examples include leveraging copper wire “last-mile” networks through DSL technologies, re-architecturing of cable networks to support IP services and advances in optical networking technologies. This chapter has reviewed some of the ITU-T standards that are being developed and deployed to improve access to the Internet and other IP-based networks. See ITU Recommendation ITU-T G992.5 at: http://www.itu.int/rec/recommendation.asp?type=folders&lang=e&parent=T-REC-G.992.5. See ITU-T publication ITU-T G.991.2 at: http://www.itu.int/rec/recommendation.asp?type=folders&lang=e&parent=T-REC-G.991.2. See ITU-T publication ITU-T G.995.1, “Overview of digital subscriber line (DSL) Recommendations” at: http://www.itu.int/rec/recommendation.asp?type=folders&lang=e&parent=T-REC-G.995.1. See the DSL forum FAQ page on SHDSL for more information: http://www.dslforum.org/aboutdsl/shdsl_faq.html. See ITU Recommendations ITU-T G.992.3 and ITU-T 992.4 at: http://www.itu.int/rec/recommendation.asp?type=folders&lang=e&parent=T-REC-G.992.3 and http://www.itu.int/rec/recommendation.asp?type=folders&lang=e&parent=T-REC-G.992.4. See ADSL2 and ADSL2plus – The New ADSL Standards at: http://www.dslforum.org/aboutdsl/ADSL2_wp.pdf. See http://www.cablelabs.com/news/pr/2002/02_pr_itu_docsis_2.0_121902.html for a summary of the two Recommendations.